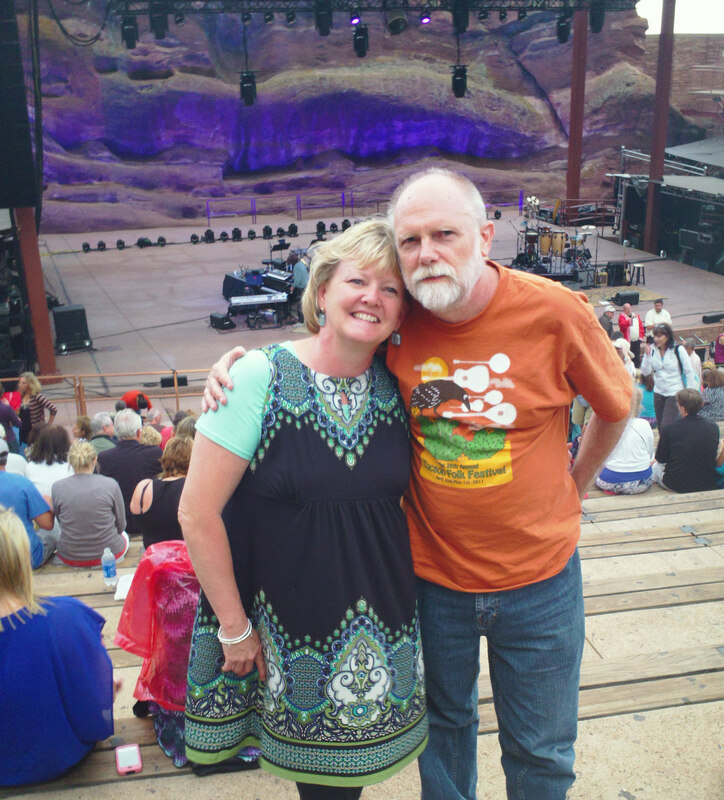 On July 23rd I had the extreme privilege of attending a James Taylor concert at Red Rocks Amphitheatre just outside of Denver, Colorado. If you’ve never been there, you should make plans to go. There’s just something magical about listening to music outdoors, especially on a cool Colorado summer evening. James Taylor just happens to be the ONLY musician that I like enough to sign up for his mailing list. He’s so amazing! You know, its not that he’s an outstanding vocalist or flashy instrumentalist (although he sure knows how to put a band together), but his songs come straight from the heart and he’s authentic. Every time I’ve gone to one of his concerts, I feel like I’m sitting in the living room sharing good music with friends. And since my husband is a musician, I really know what that feels like. It’s pure joy! So, several months ago when I got an email saying that he (James, not my husband) was going on tour and would be playing in Denver, I talked my husband into getting tickets for my birthday (which happens to be in July). 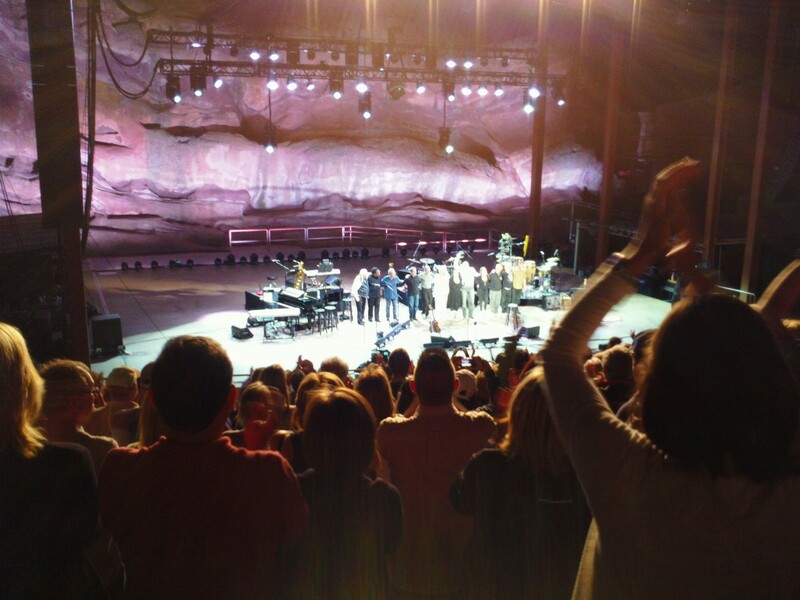 Our son lives in Boulder and we knew we’d be going to visit him sometime, so we planned to be there for the concert too…AND since I’m on JT’s mailing list, we were able to get tickets before they went on sale to the public, so we were in row 14! 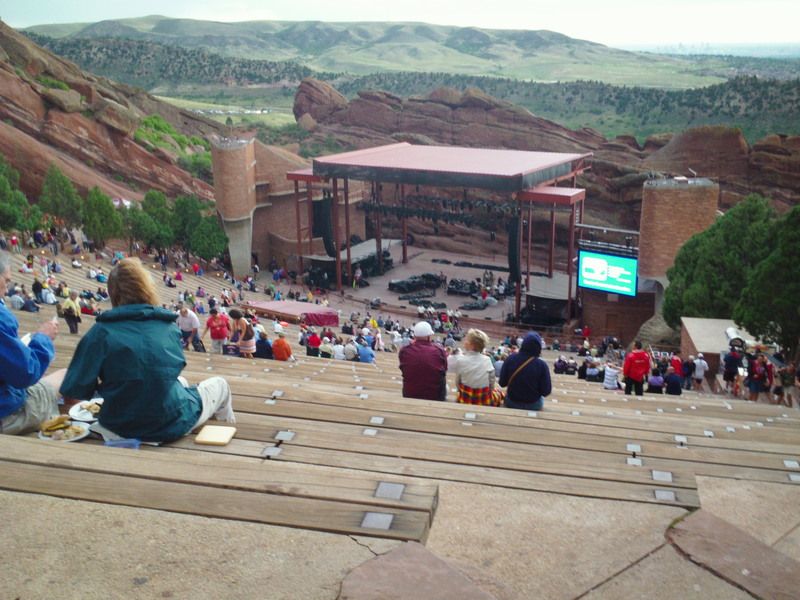 The photo above is from near the top of the amphitheatre. That’s a long way up! This is the walkway that leads to the seating area. 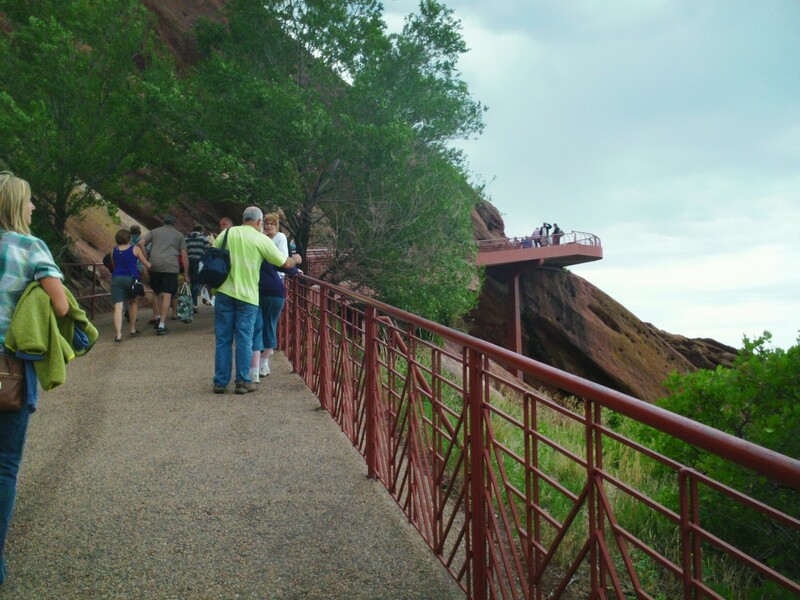 It’s a bit of a hike, but not too bad. The pics below show our location in relation to the top and to the stage. It was a perfect spot! Unfortunately I wasn’t able to take in my camera, but we did have Kevin’s pocket camera to take these pics. He and his date, Hattie went with us too. James and his band performed amazingly well considering the distraction from the wind (and potential storm). I did notice though that he’s reminding me more and more of my dad. You see, he’s tall and thin and built like my dad and he’s bald like my dad and this time when JT was “dancing”, with his somewhat awkward moves that make him so endearing, I could totally see my dad. I LOVED it! So he’s not only a wonderful performer, but also a fond reminder of my dad, who passed away over 30 years ago. Just to give you a little taste of what it was like at the concert I recorded one of my favorite songs, “Sun on the Moon” with Kevin’s little camera. The lighting is way too hot on JT and my hand is a bit shaky, but I love the rhythm, arrangement and the harmonies in this song. And check out the cheers when JT starts “dancing”. Gotta love this guy for his down to earth performances. Nothing flashy or overly choreographed here. The last pic here is the band taking their bows. It’s hard to tell, but it really is James Taylor and his band. 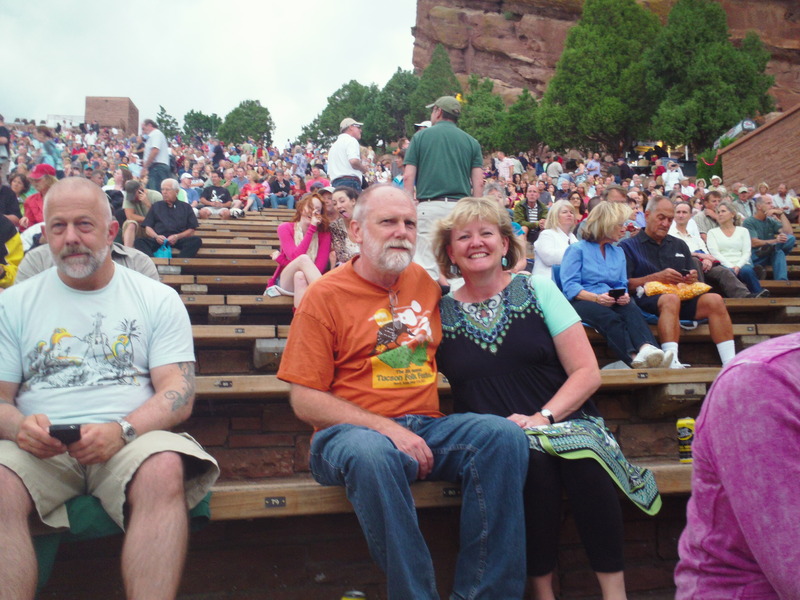 Funny thing too, we found out later that another couple we know from Phoenix was at the same concert. Only we didn’t find out until after we got home. It was a spectacular night and makes me smile just thinking about it. Wish you could have been there with us! Wow! Great post Nancy! What a breathtaking venue! And really enjoyed the video you got from Kevin’s camera too. A birthday celebration you will long remember.